Being able to work online has its benefits, such as having the flexibility to work nontraditional hours with clients from countries around the world, but it’s also easy to get distracted. Fortunately, there are several tools available to help improve concentration and productivity. Sometimes, all we need is a little added motivation, like an egg timer or alarm, to challenge us to remain focused and get to the finish line. If that’s the case for you, a simple online alarm clock or timer can help boost productivity. Naked Alarm Clock. A simple and free online alarm clock, Naked Alarm Clock makes it easy to lose yourself in the task at hand without worrying that you’ll miss your next appointment. Your Meditation Timer. If you get annoyed with more-traditional-sounding alarms, a meditation timer might be music to your ears. A soft gong or Tibetan bell can let you know it’s time to change tasks. Online Stopwatch. For every type of timer imaginable, look no further than this Online Stopwatch. The Pomodoro Technique involves breaking work up into timed 25-minute chunks (known as pomodoros), separated by short breaks to help improve concentration. There are several apps based on the idea. Focus Booster. This app helps eliminate the anxiety of time and enhances your focus using the Pomodoro Techinique. Pomodoro (Mac (s aapl) only). Another Pomodoro supporter, this app helps you to avoid procrastination and get things done. For the analytical among us, more-detailed automated time tracking and monitoring may do the trick for increasing productive time online. RescueTime. This tool lets you track your Internet usage while also allowing you to voluntarily block distracting websites. TrackTime. This app allows you to track the time you spend on projects, as well as your web-browsing habits. Sometimes the problem with getting things done isn’t our lack of effort but rather constantly overextending ourselves. This is where a forced break or time-out can help. Time Out (Mac only). Time Out gently reminds you to take breaks on a regular basis. SmartBreak (Windows only). SmartBreak also reminds you to take breaks when working on your computer for long hours. For many of us, the Internet is filled with tempting distractions that keep us from the task at hand, which is where website-blocking tools come in handy. 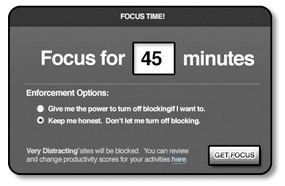 StayFocusd (Chrome extension). This productivity extension for Google Chrome (s goog) restricts the amount of time you can spend on time-wasting websites. For those of us who need complete isolation in order to get focused, there are certain tools that hone in on a single task until the job is done. FocusWriter. FocusWriter provides a simple, distraction-free writing environment. Think (Mac only). This tool limits your attention to one application at any time to keep you from getting distracted. Quiet (Mac only). Quiet allows you to focus on a single window while simultaneously fading out others. Haze Over (Mac only). This app helps you stay focused on your main window by dimming inactive windows. Concentrate (Mac only). Perhaps the most robust of all the apps, Concentrate allows you to create “activities” (for example: design, study, write) with customized actions that run every time you concentrate on a given task. Isolator. This tool helps you concentrate by covering up your desktop, its icons and the windows of other applications. While the Internet has its advantages when it comes to work, it can also be a distraction. But with the right app to help maintain concentration and focus, it’s a lot easier to stay on track and get things done. What are your favorite focus-boosting apps and tools? Photo courtesy Flickr user BY-YOUR-? I found this entry looking for blogs with the “Pomodoro” tag. Came up with a few productivity hints and a lot of great looking recipes. Love some of your links – especially the “Naked Timer” – for some reason I never thought of using an online timer app. I’m a huge fan of OmmWriter. Highly recommended, distraction free writer, with integrated peaceful ambience.